I wasn't a Christian very long before I did a church course on the foundation doctrines, during which I was introduced to the concept of paying 10 per cent of my income as tithe. This was hard for me. Anyway, I stayed away from church. I felt I didn't have a right even to talk to God, and as a result, smoked so much more marijuana and drank so much more alcohol than usual because I couldn't stand being separated from God. At the age of 26, I had a stroke and was hospitalised for three weeks and then went on to rehabilitation. 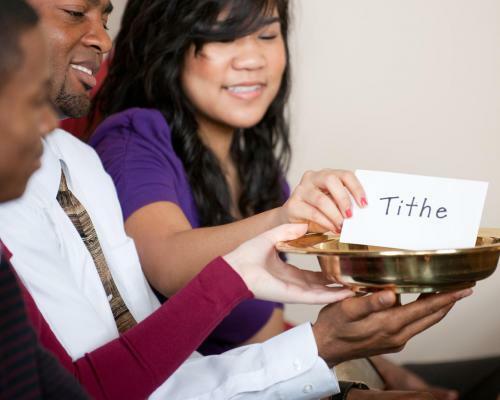 After getting out of hospital, God changed my heart and mind about tithing, so I was able to tithe without questioning, like paying taxes, a bill or the mortgage. Anyway, God is so good to my daughter and me. After faithful tithing I was offered a redundancy payment by my employer. I invested the money for a year, then bought a house for $62,500. After being in the house three years, I decided it was best for my daughter and me to sell the house, pay off the mortgage and buy a mobile home in a beautiful local caravan park. The perfect van was available and I could afford it. But the house would not sell. I dropped the price to $64,000, which is all I paid, plus repair costs. I got so depressed and cried out to God for months. I said, "Lord, if I were being greedy I would understand You are holding back the sale, but I can't sell at a loss after I bought the house so cheaply. Why should someone else reap the blessing You gave me?" Sensing my desperation, the real estate agent came around with an offer for $40,000 cash. I was so mad I told them to take the house off the market and get their sign off my lawn. I waited and wondered. Two years later the house sold for $115,000. God knew the market would appreciate. He knows everything. He blessed me in spite of myself. There were times in the first three years in the house, that all I had to spend after the bills and mortgage were paid was $6 per week. I hung in there, faithfully paying tithe and trusting. God provided in so many ways. At one time, a girl came to my door asking for an egg to make a cake. She was from a Christian family down the road, where the parents worked. I gave the egg, but I was fuming. I said, "Lord, a cake is a luxury. That egg could have made a small quiche or omelette, and it was my last one, for my daughter and me, and they asked for it to make a treat. How could I say no, especially to a child? "Lord," I asked, "aren't they unfair and plain rude asking someone in my situation for help?" The next day, my pastor contacted me. "We've got 120 eggs left over from the egg farm and we can't get rid of them," he said. "Do you know someone who needs them?" I had more than enough eggs to share. I am convinced God has a sense of humour. I could write a book on God's faithfulness. I am so grateful for God's intervention, truth and patience. Great is his faithfulness; his mercies begin afresh each day. I say to myself, "The Lord is my inheritance; therefore, I will hope in him!" Lamentations 3:23, 24. Sherry Tait, who lives in Lilydale, Victoria, has completed a counselling course and was recently baptised.